This week, two political candidates for the Compassion party were arrested and charged with possession of 48 pounds of cannabis, after a raid of their home. 58-year-old Anne Armstrong and 48-year-old Alan Gordon admit to growing the cannabis, but they say that it is strictly for religious and medical purposes and that they give it away for free, they don’t sell any of it. The pair says that they were not aware of how much they were growing because they never use scales, they typically just turn the plant into oil and give it away as a part of their religious services. Armstrong and Gordon are the leaders of a Christian sect called The Healing Church, which uses cannabis as a part of their services. Misunderstanding about the true nature of the cannabis plant and its role in Jewish and Catholic practices throughout history have led to the mistaken inclusion of cannabis in the Controlled Substances Act and the demonization of what Catholic mystics called “Mary’s Medicine” under the sacrilegious name ‘m—-juana’. A flourishing Healing Church can continue the apostolate of compassion long practiced by the catholic church. St. Scholastica, the twin sister of St. Benedict was reknown for healing convulsive children with cannabis oil. St. Hildegard of Bingen, herbalist, musician and Doctor of the Church, healed the sick with cannabis oil and documented her work extensively. Police say that they received a complaint of a strong odor coming from their residence on Sept 1, but Armstrong and Gordon say that this attack is politically motivated. Rhode Island is a medical marijuana state, but outdoor growing is illegal, and they do not have the expensive permits that are required to grow indoor for the state’s medical program. The pair are no strangers to cannabis activism, in 2015 they appeared before the House Judiciary Committee of Rhode Island to speak in favor of the plant. In one extreme campaign, they even dared the government to test the Zika virus on them so they could prove the healing power of cannabis. This is not the first time they have been arrested for cannabis either. 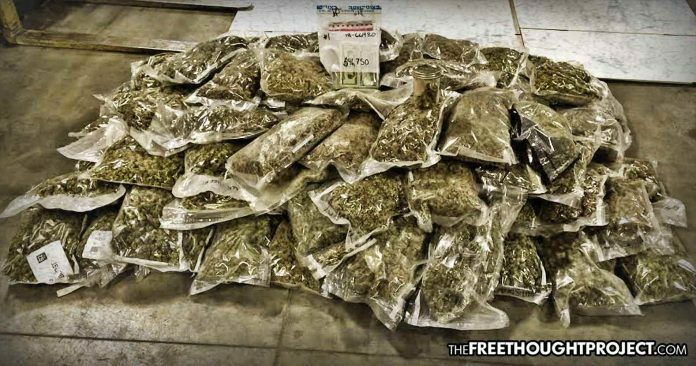 Back in 2016, they were both arrested after they were found with 12 pounds of cannabis, as well as 10 pounds of oil and 59 additional plants. All of those charges were eventually dismissed. As the Free Thought Project previously reported, perhaps it’s time we start electing candidates who openly use cannabis. If members of government frequently engaged in smoking pot, perhaps they’d overturn the laws which require cops to lock people up for it. If more members of government smoked weed, perhaps they’d be less apt to drone bombing children in Afghanistan, Iraq, and Yemen. Sadly, however, the current charges faced by these two can carry a life sentence.